Don’t expect a cradle-to-grave depiction of Steve Jobs’s life from Aaron Sorkin’s upcoming movie, said Sorkin, who has signed on to write the would-be blockbuster biopic, based on Walter Isaacson’s biography and made by Sony Pictures Entertainment. To those people, he warned that the movie will be more of a painting than a photograph. But it’s not like Sorkin has finished a script yet. The Jobs project is at the earliest stages, he said. “I will be going through a long period that would not look to the casual observer like writing. It will look more like watching ESPN; to the untrained eye, it would look like watching college football. It’s a process of procrastination,” he said of his creative process. What actor will play Jobs? Sorkin said he didn’t know, but it had to be someone smart, because that’s impossible to fake. Sorkin said he’d describe his career as a pattern of writing about people who are smarter than he is, something he was inspired by from a young age, growing up in a family of people smarter than he was. “I really fell in love with the phonetic sound of intelligence and the sound of a really good argument,” Sorkin said. 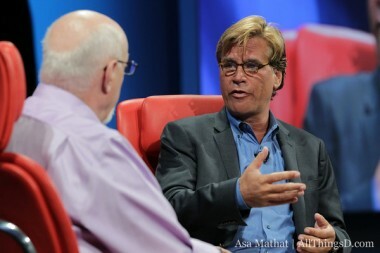 Mossberg asked Sorkin if he plans to portray Jobs as an antihero.